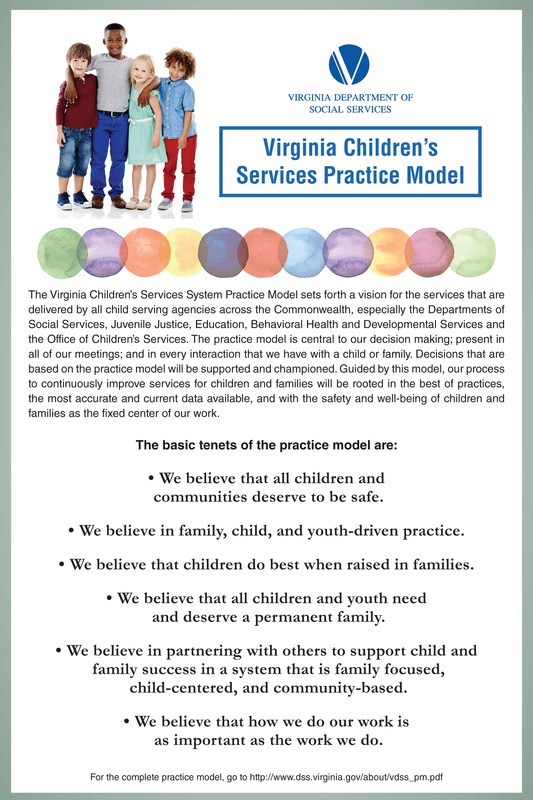 "Breaking New Ground with the Practice Profiles"
The Virginia Children's Services Practice Model provides guiding principles that describe the scope of services and how they are delivered to families. Commitment to practice model values is the first and necessary component of creating a strong, quality approach to helping families. Next are the Practice Profiles. The profiles demonstrate how the model is put into action. Practice Profiles describe the core activities associated with Practice Model and values, making them "teachable, learnable and doable." Developed by local social service agencies through a learning collaborative process, the Practice Profiles consist of 11 core skill sets: Advocating, Assessing, Collaborating, Communicating, Demonstrating Cultural and Diversity Competence, Documenting, Engaging, Evaluating, Implementing, Partnering, and Planning. The Practice Profiles define best practice from first contact until permanency is achieved for the child or youth. Casey Family Programs, a long-time partner with VDSS, supported the development of the Practice Profiles and is currently funding a ground-breaking study to assess their impact. Through 2018, Rutgers University School of Social Work is partnering with VDSS to and 18 local agencies that volunteered to participate in the study. Virginia is the first child welfare system to take this innovative approach and is a national leader in practice model development. The results of the study will inform improvements to achieve the best possible outcomes for children and families by improving worker and supervisor skills.